Once vilified and feared, the Great Barracuda is now a popular game fish here in the Keys and often saves the day during winter fishing. These fish are often the go to species when the weather gets cold and keeps the bonefish and permit off the flats. Guides as well as recreational anglers can sight fish for barracudas laid up on the flats. It’s an exciting thing to see when you cast your tube lure and watch the torpedo shoot though the water and smash into the lure. Aside from the excitement of catching one, for the non-angler they still have the a certain cache’ as a dreaded killer fish and make for a good story. This denizen of the deep, however, now appears to be declining. Guides are reporting lower numbers of big fish moving onto the flats. 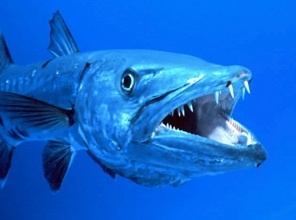 Currently, the barracuda are an unregulated species. This means that anyone can catch and kill as many as they want, whenever they want. Now, I’m not saying that this is the reason for the decline, but if the fish is not as prolific as it once was, maintaining the barracuda as unregulated is a sure fire way to send this mighty pugilist of the flats into the pages of history. The Lower Keys Guides Association is calling on anglers and non-anglers to stand up for this great fish and let the powers that be know that even mean and ugly fish need help too. So, if you think that this great fish is worth saving, or it has saved a fishing trip for you, take a moment and check out the LKGA’s website and drop a line to the folks who make policy and regulation and let them know how you feel. What to do, contact FWC, visit the LKGA website to find out more. Latest news is that the FWC is considering rules this September that include protections for the barracuda. However, there is a section that allows for trophy hunting. Please take a moment to check out BTT and the LKGA’s pages to find out what you can do to help at this important session.